The 2014 International UNESCO-Equatorial Guinea Prize for Research in Life Sciences has been awarded to two scientists and one research institution in recognition of their efforts to improve the quality of human life. The Prize recipients are Professor Hossein Baharvand, from Iran, a Specialist in Stem Cells and Developmental Biology at the Royan Institute for Stem Cell Biology and Technology and the Head of Department of Developmental Biology at Iran’s University of Science and Culture, whose stem cell research has led numerous applications in regenerative medicine; Andre Bationo, from Burkina-Faso, a specialist in soil chemistry whose work has led to improved techniques for agricultural production in Africa; and the Instituto de Medicina Tropical von Humboldt (IMT) at the Universidad Peruana Cayetano Heredia of Peru. The Institute was founded in 1968 with the mission of promoting education and research on the most prevalent tropical diseases in Peru. From its founding, it has performed high quality research that has contributed to controlling diseases such as tuberculosis, malaria, leishmaniasis, leptospirosis, HIV-AIDS and others. During the announcement, the United Nations Organization for Education, Science and Culture (UNESCO) highlighted the Prize’s objective of mobilizing science knowledge and policy for sustainable development and fostering capacity-building in science and innovation. This is the second year the prize has been awarded. It was established by the government of Equatorial Guinea to reward projects and activities of individuals, institutions, other entities or non-governmental organizations for scientific research in the life sciences, with a view to improving the quality of human life. UNESCO’s Director General, Irina Bokova, announced the recipients on August 26 and said they will be presented next month in Malabo, Equatorial Guinea. Next month in Equatorial Guinea, a scientific round table will address issues of particular concern to Africa and the world as a whole, including the management of the current Ebola epidemic, the African traditional pharmacopoeia and its potential integration into public health systems among other issues. The government of Equatorial Guinea has built basic infrastructure in the country over the past 20 years such as social housing, roads, electricity, health and education facilities, and water accessibility, said Equatorial Guinea’s Health Secretary of State, Maria del Carmen Andeme Ela. Secretary of State Andeme Ela recently highlighted important actions the government has undertaken to improve social welfare for its citizens at the Equatorial Guinea Economic Forum, held at the St. Regis Hotel in Washington, D.C., on August 8. The Ministry of Health and Social Welfare has had support from development partners and due to the country’s progressive economic growth, it has been able to provide free public health services. As a next step to improve the social welfare of its citizens, the government is working to provide access to health services via a health card, update regulations in the pharmaceutical sector, and provide an extensive program of human resource development at all levels. Equatorial Guinea’s infant mortality rate has decreased from 111 in 1994 to 65 per one thousand in 2011, said the country’s Health Secretary of State, Maria del Carmen Andeme Ela. She also reported that the percentage of pregnant women receiving prenatal care from skilled health personnel has increase from 61% in 2000 to 91.3% this year. Secretary of State Andeme Ela recently discussed the national health system and programs available in the country at the Equatorial Guinea Economic Forum, held at the St. Regis Hotel in Washington, D.C., on August 8. The economic forum aimed to highlight the strategic commitment of Equatorial Guinea to economic diversification and encourage investment by American companies. The government of Equatorial Guinea has heavily invested in the country’s health sector as part of UN Millennium health goals and the country’s Horizon 2020 development plan. Secretary Andeme Ela highlighted how the country’s social-health profile are steadily improving. She said that births attended by skilled health personnel have increased from 52% in 2000 to 70% in 2014. She also cited improvements in the country’s health infrastructure, which now includes 2 regional hospitals, 5 provincial hospitals, 11 district hospitals, 45 health centers, 2 regional centers for blood transfusions, 4 provincial centers for transfusions, 2 reference medical centers (La Paz) and 7 polyclinics (3 private), various medical offices and pharmacies throughout the country. During her presentation, Secretary Andeme Ela also outlined the national health programs the country is currently undertaking, such as the vaccination program, the fight against malaria, programs to provide essential medications and oral healthcare, diagnosis and treatment of HIV/AIDS, the fight against non-infectious diseases, efforts to control tuberculosis, leprosy and trypanosomes, the fight against river blindness and filariosis, and promotion of health and reproductive health. The number of medical and health professionals and technicians in the country is growing significantly, although the country still suffers from a lack of specialists, said Secretary Andame Ela. The Faculty of Medical Sciences at the National University of Equatorial Guinea graduates about 45 medical students and 25 nursing students each year, and the National School of Public Health and Environment graduates about 54 nurses annually. All told, the nation now has more than 300 doctors, more than 350 nurses and similar professionals, and some 2,000 trained medical assistants and technicians. She said that the country had only one Equatoguinean doctor when it gained independence in 1968. The government of Equatorial Guinea has temporarily suspended the issuance of visas from neighboring countries and cancelled regionals flights by its national air carrier, Ceiba International, as measures to protect the country against the spread of the Ebola virus. This is one of a number of preventive measures taken by the country after it formed a national commission to lead anti-Ebola efforts. The government is also preparing to purchase additional ambulatory hospitals (tents), train health personnel assigned to these health units and purchase drugs for palliative treatment, among other initiatives. The government of Equatorial Guinea has created a national health crisis committee as part of its efforts to mount a campaign to prevent the spread of ebola to the country. The ebola prevention campaign aims to purchase the necessary materials to control the infection and manage cases of infection that might arise, as well as two special ambulances to transfer ebola patients, and two thermographic cameras for the airports in Malabo and Bata. The campaign also plans to acquire 8 ambulatory hospitals (tents), train health personnel assigned to these health units and purchase drugs for palliative treatment. The government is also considering taking body-temperature readings with laser thermometers at the country’s entry points and with thermographic cameras at airports in Malabo and Bata and creating awareness campaigns for governors, the government delegates and the presidents of neighborhood communities and village councils in order to provide information down to the village level on ways to prevent the transmission of ebola. The government will also deliver notification forms to the airports, ports and airlines; raise awareness among the population and emphasize how ebola can be transferred from infected animals to humans and from person to person; create massive awareness at the national level on protective measures through television, radio spots, churches, schools, and markets; and organize teams at the national, provincial and district levels to carry out a comprehensive campaign on the prevention of this pandemic in the provinces and districts. Minister Diosdado Vicente Nsue Milang and the Ministry of Health and Social Welfare have been leading the campaign efforts with the cooperation of the Ministry of Information, Press and Radio, Ministry of Internal Affairs and Local Corporations, and the Ministry of Justice and Religious Affairs. The Ministry of Health and Social Welfare of Equatorial Guinea has been proactive in implementing awareness campaigns to fight diseases affecting the African continent. Earlier this year, they implemented a comprehensive campaign to immunize the nation’s children against polio. The government worked closely with World Health Organization (WHO), UNICEF, United Nations (UN),Center for Disease Control and Prevention (CDC) Atlanta, the Bill & Melinda Gates Foundation and others to implement this proactive campaign. Equatorial Guinea’s Minister of Mines, Industry and Energy, Gabriel Obiang Lima, recently met with U.S. Congresswoman Marcia L. Fudge to discuss the development of important cultural and economic ties between the Republic of Equatorial Guinea and the United States of America’s institutions. “The Ministry of Mines, Industry and Energy is more than willing to open the doors for any potential investor who is willing to develop the country and contribute to our efforts of diversifying our economy. We want to develop all industries as we have the capacity and the willingness,” said Minister Obiang Lima during the meeting with Congresswoman Fudge. Minister Obiang Lima invited Congresswoman Fudge and members of the Congressional Black Caucus to visit Equatorial Guinea to see the developments the country is experiencing. 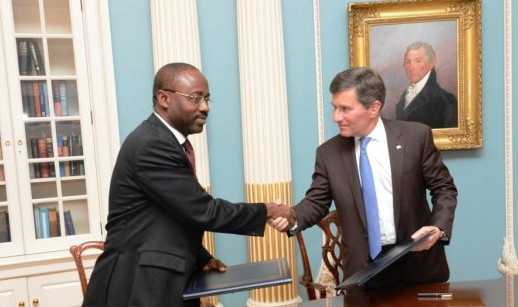 Equatorial Guinea’s Minister of Foreign Affairs and Cooperation, Agapito Mba Mokuy, signed an open skies air transport agreement with United States Assistant Secretary for Economic and Business Affairs, Charles Rivkin aimed at formalizing the liberalization of their bilateral aviation relationship on august 7, 2014. 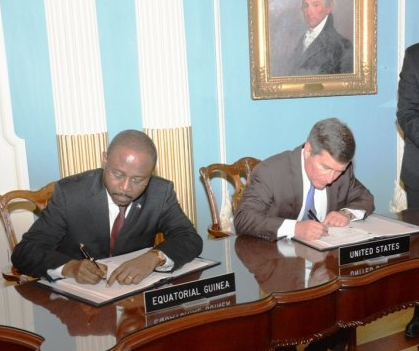 Equatorial Guinea and the United States initialed the agreement in December 2013, and it has been applied via comity and reciprocity since that time. The open skies air transport agreement goes into effect upon the signing by the two parties. The agreement allows unrestricted air service for the airlines of both countries and eliminates restrictions on the frequency of flights, the type of airplanes that can be used and the prices each airline charges. The agreement will allow for the strengthening and expansion of trade and tourism links between Equatorial Guinea and the United States, which should benefit both countries. Business travelers and tourists alike will benefit from expanded opportunities for air service and greater price competition by airlines, while commitments to aviation safety and security will be maintained. Air service to Equatorial Guinea has grown significantly over the last several years. The country currently is served by Air France, Ethiopian, Iberia, Lufthansa, Royal Air Maroc, and Equatorial Guinea’s national carrier, Ceiba International, among others. President Obiang Nguema Mbasogo presented the opportunities offered in Equatorial Guinea to foreign investors and said that American companies operating in the country can take credit for pioneering a national industry that is now contributing to the development of both Equatorial Guinea and the American economy. The Equatorial Guinea Economic Forum, which was held at the St. Regis Hotel in Washington, D.C., aimed to highlight the strategic commitment of Equatorial Guinea to economic diversification and encourage investment by American companies. The forum presented opportunities for growth in the sectors of agriculture, finance, health, mining and hydrocarbons. In addition, it presented the new structure of governance in the country, the status of the Horizon 2020 economic and social development program, and the country’s commitment to ensure the security of foreign investments in Equatorial Guinea. In his opening remarks, President Obiang said that Equatorial Guinea is committed to reaching the Millennium Development Goals by 2020, including reaching the status of “emergent economy,” which he described as a self-sufficient economy. “Our country is devoting all efforts to achieve economic diversification by developing other sectors and services that allow us to reduce dependence on the hydrocarbon sector,” he said. Equatorial Guinea has used its petroleum resources to vastly improve basic economic and social infrastructure, which is essential for establishing a profitable investment climate. He said the nation had established a national co-investment fund that will support national and foreign private initiatives in the priority productive sectors of interest. The fund is capitalized at one billion dollars. “We are gathered here to exchange information, know each other better and create an environment of trust to facilitate the investment of foreign capital in Equatorial Guinea,” he said. President Obiang said Washington, D.C., was political center of Africa this week. He said that leaders at the U.S.-Africa Leaders Summit discussed the present and future of our continent and the possibilities for mutual beneficial partnership between Africa and the U.S.
President Obiang Nguema Mbasogo called on American companies to increase cooperation with African countries in remarks during a meeting marking the 10th anniversary of the Malaria Control Program on the Island of Bioko (PCBIB). In his closing remarks, president Obiang gave his observations of the U.S.-Africa Leaders Summit and the discussions of African and American leaders about the possibilities for greater cooperation between the U.S. and the African continent. “Our relationship with American companies is a clear example of a positive partnership on public and private investment that benefits both of our nations. I would like to invite other private American companies to join to this positive journey we are experiencing,” said Obiang. The biggest impact of this program has been the vaccine project aimed at eliminating malaria in the country by 2020. “Equatorial Guinea is in the process of finalizing an agreement with our partners and Sanaria, an American biotechnology company specialized in malaria vaccination, to reach our objective to eradicate malaria not only from our country but the world,” he said. Since Equatorial Guinea discovered oil, the government has used its revenues to improve the quality of life of its citizens. The PCBIB is a clear example of how the government is investing oil revenues in the country. The program is sponsored by the Equatorial Guinea government, Marathon Oil, Noble Energy, AMCO Methanol, GePretrol and Sonagas. The Equatorial Guinea delegation, led by President Obiang Nguema Mbasogo, participated in the leaders session that took place at the U.S. State Department on the last day of the U.S.-Africa Leaders Summit, which is being held in Washington, D.C.
Today’s agenda focused on the following leaders sessions: investing in Africa’s future, where attendees held a dialogue on inclusive, sustainable development, economic growth, and trade and investment; peace and regional stability to discuss shared concerns regarding peace and security, including a conversation on long-term solutions to regional conflicts, peacekeeping challenges, and combating transnational threats; and governing for the next generation, where leaders discussed the greatest challenges and opportunities for Africa’s continued political and economic progress and a specific focus on governance. The last day of the summit will conclude with a leaders press conference. The inaugural U.S.-Africa Leaders Summit has brought African and U.S. leaders together to discuss and address issues of shared interest and mutual concern. Equatorial Guinea’s First Lady, Constancia Mangue Nsue de Obiang, joined other African First Ladies at a spousal program focused on the impact of investments in education, health, and public-private partnerships, which was hosted by the United States First Lady Michelle Obama, in partnership with former First Lady Laura Bush and the Bush Institute. The program is being held at the John F. Kennedy Center for the Performing Arts. On Friday, August 8th, Equatorial Guinea will host an economic forum where Minister of Mines, Industry and Energy Gabriel Mbaga Obiang Lima will speak about progress in the country and discuss the ways the global energy market is changing and companies are looking outside of traditional Western markets to identify new and emerging economies. The transformations happening in Equatorial Guinea provide a snapshot of what is happening across the African continent and throughout most of Asia. In the last several years, some of the world’s largest resource exploration companies, Marathon, Exxon Mobil, Noble Energy and many more, have laid the foundation for development and economic growth in many other aspects of the Equatorial Guinean economy. The growth of the Equatorial Guinean economy benefits more than just the business community in the country. It trickles down and is having a positive impact on the entire population in the form of improved infrastructure, healthcare, and education systems. With the essential infrastructure in place, President Obiang is working to transform more than just the economy of Equatorial Guinea. Country prepares to host Economic Forum in Washington, D.C.
Equatorial Guinea’s president, Obiang Nguema Mbasogo, attended the U.S-Africa business forum hosted by Bloomberg Philanthropies and the U.S Department of Commerce as part of the U.S.-Africa Leaders Summit taking place in Washington, D.C. this week. The business forum brought African and U.S. leaders together to participate in the following sessions: expanding opportunities, the new era for business in Africa; open markets, financing the Africa of tomorrow; powering Africa, leading developments in infrastructure; and game plan, shaping the future of a fast-growing continent. U.S. President Obama will close the forum, which is being held at the Mandarin Oriental Hotel. This afternoon President Obiang will join his counterparts at a dinner at the White House in honor of the U.S.-Africa leaders summit. The Equatorial Guinea delegation is preparing to host an economic forum on Friday, August 8th, aimed at providing insight on the country’s investment opportunities. The Ministry of Mines, Industry and Energy has guided the development of Equatorial Guinea’s oil and gas resources from a production of 5,000 barrels of oil per day (bopd) in 1992 to 270,000 bopd in 2013. Minister Gabriel Mbaga Obiang Lima will describe efforts to broaden economic development at the forum. Tomorrow, President Obiang and the Equatorial Guinea delegation will participate in the leaders session of the U.S.-Africa Leaders Summit to take place at the U.S. State Department. While in Washington, D.C., President Obiang joined African leaders at a welcome reception held at the Russell Senate Office Building. He also participated in a U.S.-Africa CEO business forum dinner.